For my second nail varnish collection post I thought I might as well look at another colour that I have quite a lot of, which is the purple's. I really thought I didn't have many purple's, but as I started pulling them out I was surprised to find I actually have quite a few, I have as many purple's as I have pink's! Please ignore the colour I've tried to cut off as much as possible in the bottom right hand corner. Some shades I had trouble trying to decide exactly what colour they were and I had decided this was purple, and then decided that it wasn't! I really wanted a dusty rose colour nail varnish and then low and behold (what does that actually mean?) my next Glossybox arrived complete with a mini Nails Inc varnish in a dusty rose shade. I'm aware this is probably more of a pink colour but I really had trouble deciding what group to put this in and in the end it went into the purples. I particularly like using my matte top coat over this shade as it looks really nice matted down. This is another nail varnish that came along in a Glossybox and I think when I received this I'd not tried an Essie varnish before. This is a light pastel lilac shade, almost verging on a grey colour as there's not very much purple in this. I'm really not sure what the I/C part of the name means! 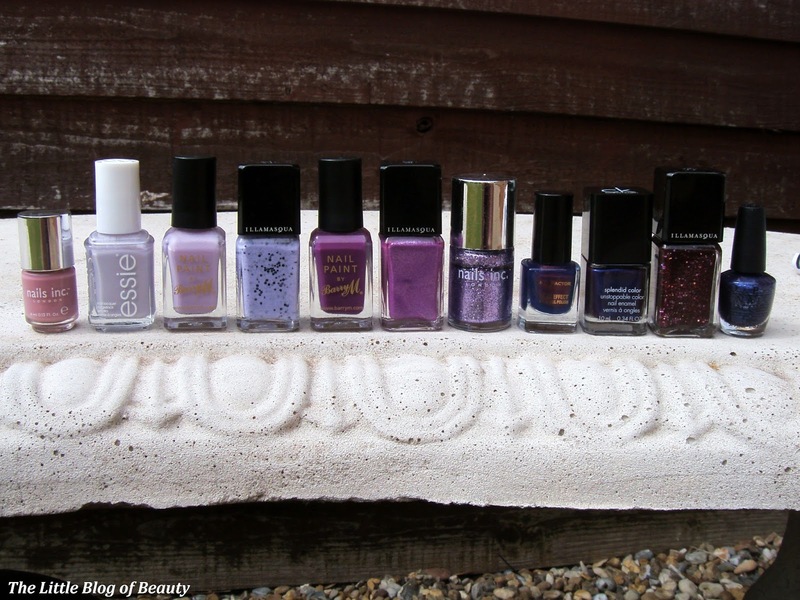 I inherited several Barry M nail varnishes from my mum's friend's daughter when she moved out and got rid of a load of her stuff. To be honest I've not really tried any of them out yet but after painting this on the wheel I quite like the colour. This is another pastel lilac colour but this is darker than Nice is Nice as it contains more purple. Speckle is one of the nail varnish's from Illamasqua's I'mperfection collection. 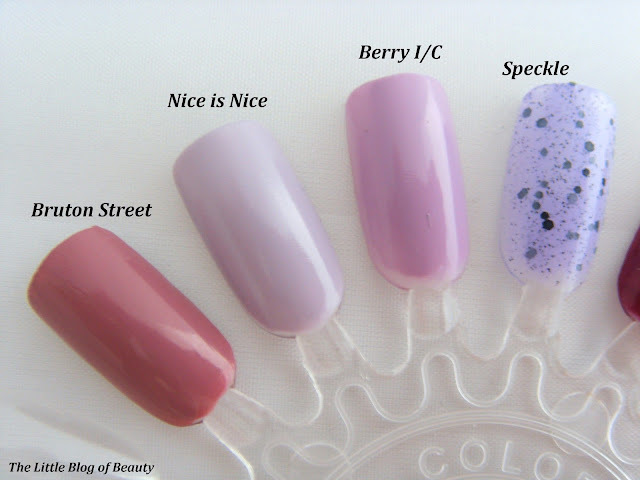 This one again is a slightly different shade of lilac that comes somewhere between Nice is Nice and Berry I/C. However this one contains tiny flecks and larger pieces of glitter that give it the speckled egg type appearance. This one is easier to remove than a full glitter varnish but not as easy as a standard polish. This is another one of the inherited Barry M shades. As I've said I haven't actually tried any of these out but again I really like the look of this shade so I may have to start using it. Although this is called Bright Purple I think this is a bit too deep to be classed as bright. I would call it a kind of a wine shade. 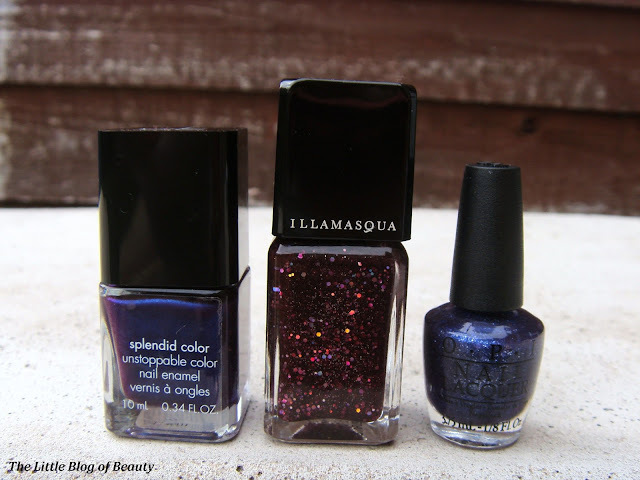 If you read my pink collection post then you'll have seen Illamasqua's Ouija, which is the pink version of Seance. The indoors shot of Seance has shown the shimmer up much better than the outside shot of Ouija. Both are such pretty nail varnishes. I have a couple of different glitter nail varnishes but I rarely wear them because they are such a nightmare to remove. However, the Nails Inc glitter varnishes are really good, providing pretty much complete coverage in just one coat (but you may want to use two coats just to make sure it's perfect). The swatch of Fantasy Fire on the wheel doesn't look anything like it actually does. This is quite a strange varnish because as you can see it's very thin (that was three coats) but it doesn't really matter because it just kind of works (although you may want to wear another shade underneath). It appears blueish in the swatch but this is a purple that contains an amazing pinky shimmer. When the shimmer catches the light it creates an amazing affect that fits the name of the varnish pretty well. This is one of several Calvin Klein makeup products that my boyfriend bought me for Christmas (he did a whole advent calender thing with makeup, so sweet!). I'm not sure where he got all the bits from but as Calvin Klein released a new makeup line with new packaging not so long ago I think this is a previous line that they may be discontinuing. This was the first time time I had given this a try and I have to say I really didn't enjoy using it. It was thin and just didn't apply very well at all, which you can see on the wheel. As I said I think this may possibly be old stock, so it may be that it's past its best, but I think I'll be getting rid of this one. Although, as you've probably worked out by now, I'm a big fan of Illamasqua's nail varnishes, this is one of my least favourite out of the ones I have. This looks really pretty in the bottle but I'm just not keen on it once it's on the nail. 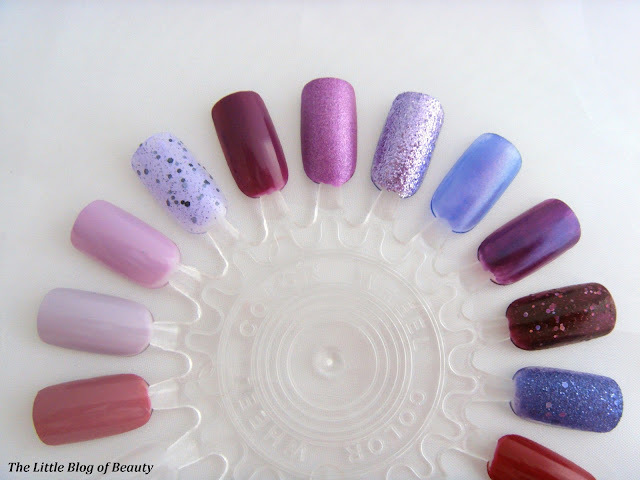 It's the same great quality as all of their nail varnishes, it's just down to personal colour/style preference. This is one of OPI's liquid sand varnishes that dries to look like, well, coloured sand! It looks slightly blue in the pictures but this is a purple. 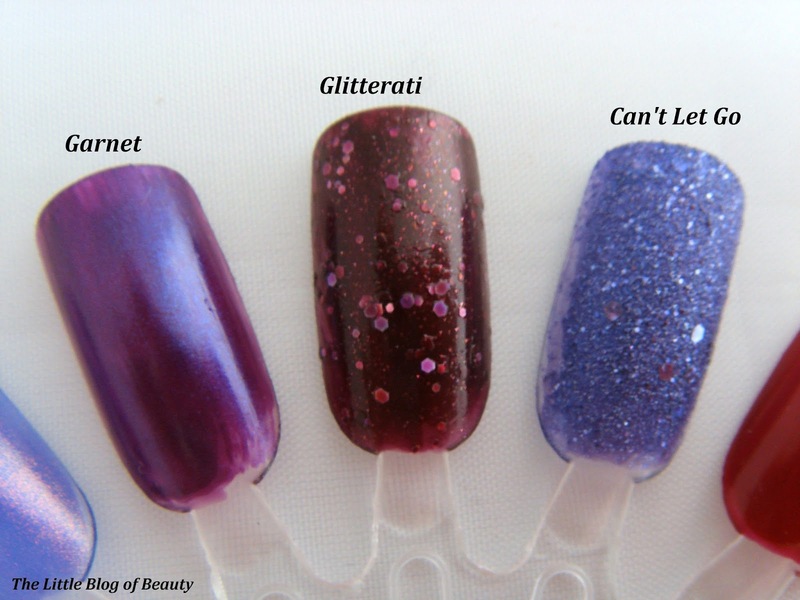 I quite like the liquid sand effect but I haven't worn any of these for a while. But if I remember correctly even though you can't wear a top coat with this (because it would ruin the effect) it lasted reasonably well but as with glitter varnishes it was harder to remove than standard nail varnishes. 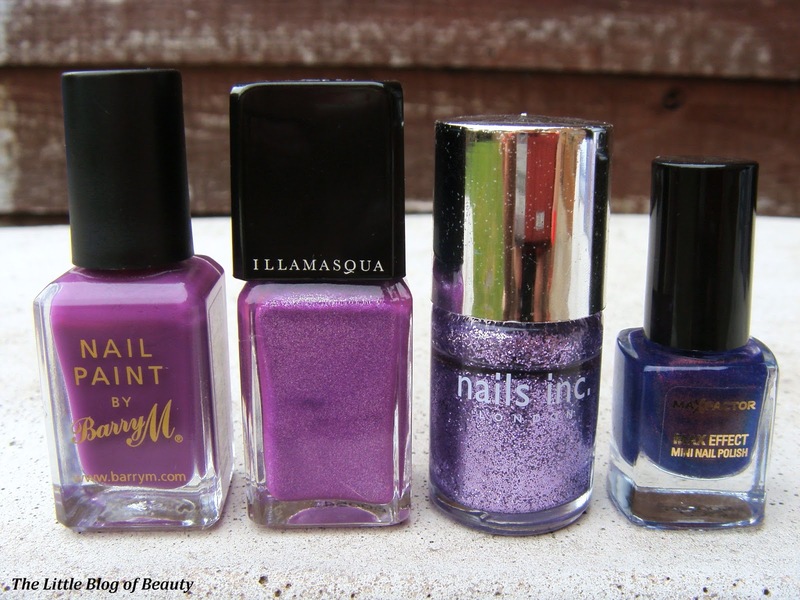 Which of the purple's I have in my collection is your favourite? 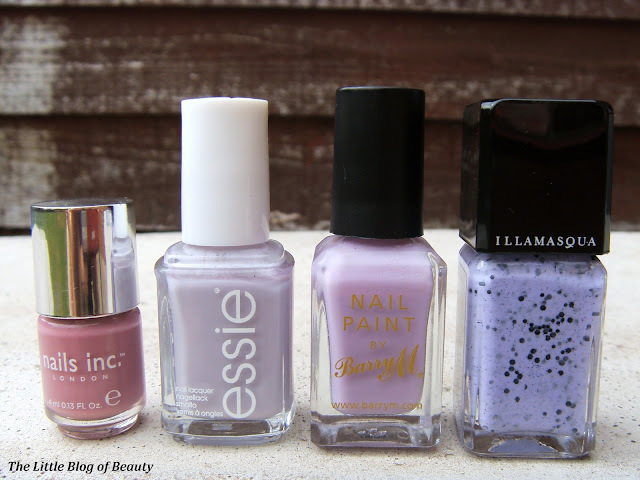 I love purple polishes too, especially pastels! I think the I/C stands for ice cream by the way, it's one of my favourites! I love this post! It was such an interesting read and I love how you organized them by colour in the photos aha, I do the same with my storage! oh my god I am going to come and just ROB you of all your nail varnishes, insanely jealous!! !